When I stop imagining, stop seeing it swim, the entire action of my scene disappears—I no longer see the flakes, I no longer see the pulse of the cup. With the jellyfish staged there, crowning the books, it’s no more alive than a portrait, thin without existence, dimension, and offering only a narrative of conjecture. This jellyfish may have once lived, it’s hard to tell. It could have and in ascribing it life, my genuine sentiment is sparked. That ascription gives it element and event, allows me to see its life as familiar, through a created memory of it, to strangely re-witness something I never first saw, its flex and stride, its story. That ascription allows me to know it. I’m in my car and listening to the world. I first turn off the radio, then shut down the car entirely. My window is open and in this corner parking spot, the snowed ground is high around me. I’m looking at two kinds of snow, one collected, truck-pushed and one naturally scattered, untouched. The truck’s snow rests peacefully by the other snow and the two lay against each other like litter-mates. The sound of a fan is somewhere; also, the blowing of stronghold leaves, like a raspy voice. I look back at my phone and on it there’s the small, framed image of a boy in his mid-twenties, though he looks younger. This makes sense. He has the smooth route of cheeks and the puff of gel-free hair that commonly indicates boys not yet run down, not world-conscious enough to care. This image is set within paragraphs of who the boy was a week ago, alive, of those that loved him but are left back, and how—we already know this—he’s dead too soon. I know this boy because I know his father. Our paths cross by way of our jobs, infrequently, but cross enough for me to know I don’t like him. It’s a test of proper compassion, to press myself to know this person outside of what he taught me about himself in boast and language, in addressing others in the company of others, in racist barbs that hang in the air like pollution on a still day. But this, I’m forced to know, is one side of the multi-sided, that even the seemingly unlovable, love. And now what I can’t get out of my thoughts is a man at a funeral, then entering the house without his son, from the grocery to the house without his son, to the house, to the house. Dietrich Bonhoeffer, theologian, dissident, said, “We must learn to regard people less in the light of what they do or omit to do, and more in the light of what they suffer.” This is now my struggle, selfishly. It’s an interesting dichotomy, having sympathy for someone navigating a tragedy while, outside the tragedy, clutching discontent towards them. It’s my stain; I have to negotiate that. Still, I consider the circuity of the year, the roll over of date, the distancing and return and I wonder if the distancing, for him, can ever possibly feel distant. I think of two lighthouses, one that points its beam forward, the light racing continuously ahead, so far that it forgets its starting point. The other in planetary revolution, hitting a certain spot on meter, tick, tick, tick… The long, extending world is a combination of both of these, ever-distancing while present; it folds upon itself. The writer Jeanette Winterson says, “There is always the return. And the wound will take you there.” And that’s it. You can only go so far away. 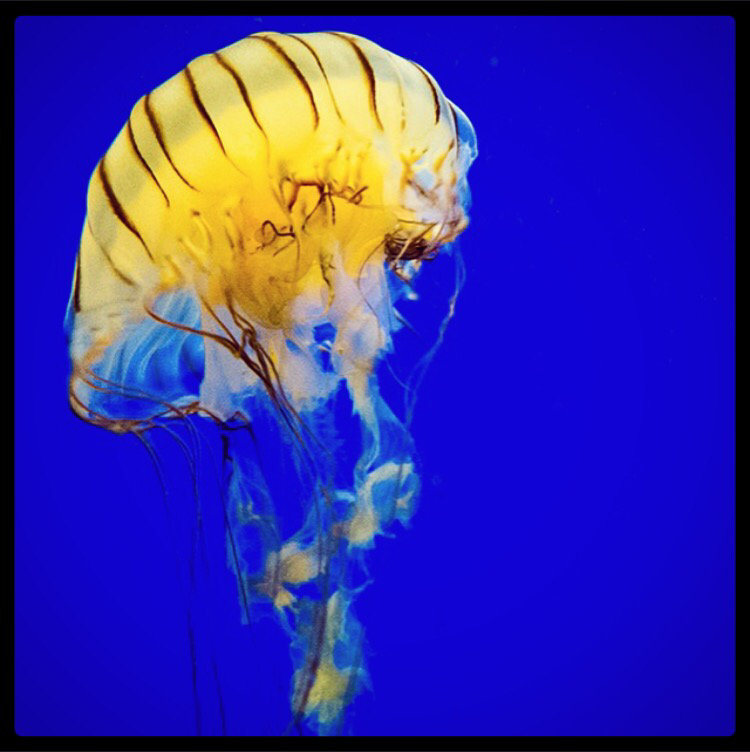 I stare at the jellyfish and think of the false motion made in the window’s reflection. That’s memory—movement, life, in a likeness of the real thing, wall shadows in a Platonic cave. I stare at the jellyfish and watch its stillness. I soon only notice its home, the resin, holding it in a moment, undisturbed, resting. The moment is a moment of finality, what it was led to. It’s become the memory, it’s become an illusion, the thing that awaits the narrative, the portrait, the boy, still, with only the ascription of life, held, in time. In that way, the resin is where I go to remember it. In that way, the resin is its grave.